Cruising on the Avalon Luminary is the ideal way to experience the majesty, extensive history and fascinating culture of some of Europe's oldest cities along its legendary rivers. Built in 2010, the Avalon Luminary holds a maximum of just 138 passengers. Visit multiple countries and cities and unpack only once, so you spend your time experiencing and enjoying Europe rather than dealing with the logistics of travel. Enjoy a highly personalized cruise experience, spacious deluxe staterooms and suites, contemporary décor, and popular onboard amenities, including a large Sky Deck with whirlpool and Sky Bistro, lounge and a bar serving premium spirits, a complimentary Internet Corner and free Wi-Fi throughout the ship, Fitness Center with state-of-the-art equipment, hair salon, and elevator. No reviews yet for this trip. Browse other reviews below for Avalon Waterways . Our experience far exceeded our expectations. Everyone and everything was wonderful. The only disappointment was the independently contracted guide that we had in Munich. He was very dismissive of Avalon's policies and made us feel he was doing us a favor by showing us around the city. Amsterdam to Budapest. Just returned River was low. My travel agent called for three days in a row before our departure. She was told there were no low water issues. The day we were to depart we were told there would be two nights on land in Frankfort. We could obtain a full refund and cancel the trip. But the rest of the trip would be fine. Not so we were "tossed off the second ship' the last two days and bused to Budapest. There is no way Avalon did not know of this schedule change. You do not make arrangements overnight for 100+ people to spend six days and four nights off the ship. Avalon was not truthful gave us a paltry return of our costs. We also found out the ships were loaded with other guests who were also being shuffled around. Terrible way to run a business. I would not endorse them to anyone....ever. Ruined a very expensive fifteen day holiday. We had the greatest time! We would definitely use Avalon Waterways in the future. The staff was exceptional meeting our every need and always with a smile. The housekeeping was not exceptional and could have been a little better. There was a wide variety of food choices but not terrible flavorful. The seafood was not always properly cooked. The activities and tours with well planned and good for people looking for athletic options. Although you could sit and relax, this cruise was more for active middle aged individuals.The tour guides were all local and outstanding. Activities and tour guides are the selling point for this cruise. Welcome to Paris, France’s capital on the River Seine, the “City of Light,” where romance fills the air. This afternoon, board your river cruise vessel and meet your crew at an evening welcome reception. Before dinner, your ship glides smoothly out of Paris. NOTE: Flights into Paris must arrive by 2:30 pm. Guests must be on board ship by 5 pm. This morning in Vernon, choose between a guided visit of Giverny and a visit to Bizy Castle. Claude Monet lived at GIVERNY for almost 43 years (1883-1926), and viewed his flower and water gardens as works of art—just like his paintings. See his collection of Japanese prints, his charming house, and his biggest sources of inspiration. Or, visit BIZY CASTLE, built in 1740 and nicknamed “Normandy’s Versailles.” It is known for its famous stables—inspired by those at Versailles—and its magnificent courtyard and water garden. After lunch, join an onboard PASTRY DEMONSTRATION before your ship arrives in Les Andelys, situated on a bend of the Seine and one of the most beautiful places in France. Join a Local Guide for a GUIDED WALK of the town, visiting the PARISH CHURCH OF LE GRAND ANDELY. Imposing Château Gaillard, built by England’s King Richard the Lionheart as a fortress in 1196, is seen above the town. Constructed in only a year, it is a masterpiece of medieval military architecture. Today, either join an excursion along the Route des Chaumières to see some of Normandy’s charming and traditional half-timbered houses with their long, sloping thatched roofs, often sporting blue wooden doors and window shutters, or visit JUMIÈGES ABBEY, a former Benedictine Abbey church considered one of the most ancient and important monasteries in the western world. The afternoon is free to explore on your own or to join an optional excursion to the pretty coastal town of Honfleur. Before dinner, you may wish to attend an ONBOARD LECTURE about D-Day. 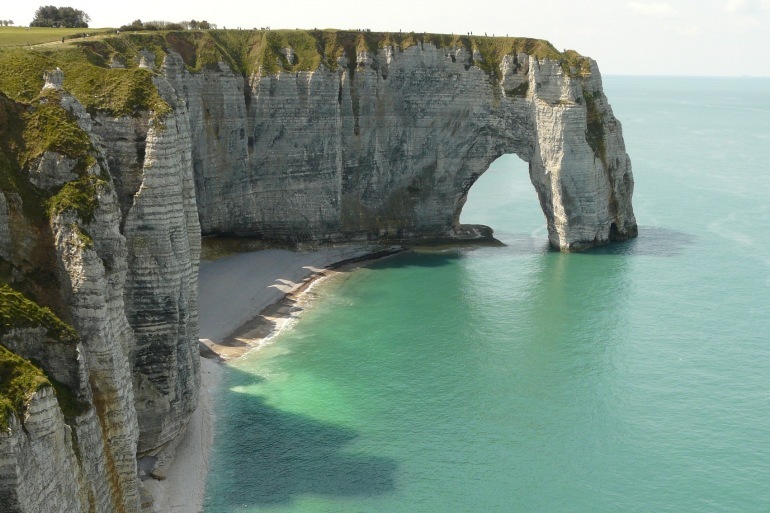 Make your choice today between an included full-day excursion to the historic NORMANDY LANDING BEACHES—with poignant sites such as Omaha Beach, the Pointe du Hoc monument, and the American Cemetery—or a “TASTE OF NORMANDY” for an in-depth look at this picturesque, mainly agricultural region. The most important products are dairy, apples, and grain. Camembert cheese is a specialty, as is CALVADOS, a strong apple brandy you’ll have the chance to taste at a local distillery. And for a touch of history, visit the famous BAYEUX TAPESTRY. Rouen, the capital of Upper Normandy, is an important commercial city perhaps best known for its connection to Joan of Arc, who lived, was imprisoned, and burned at the stake in the marketplace of this town in 1431. Enjoy the included GUIDED WALK through the medieval quarter with its half-timbered, glazed-tile houses, and take your pictures of the intricate Gros Horloge astronomical clock, dating back to the 16th century. Visit the gothic CATHEDRAL, which was once the tallest building in the world and the subject of a series of paintings by Claude Monet. The afternoon is free to explore on your own. After breakfast you may either join our included guided excursion to Auvers-Sur-Oise, the quaint little town where Vincent Van Gogh lived and died, or to Napoleon and Josephine’s Château De Malmaison just outside Paris. Requiring extensive renovations, this large country estate was purchased by Josephine Bonaparte in 1799 while Napoleon was fighting in Egypt. It was her aim to make it “the most beautiful and curious garden in Europe, a model of good cultivation.” This evening, arrive in Paris. Known as one of the world’s most romantic and lively cities, Paris is a delight for all your senses. Your included city sightseeing shows you magnificent must-see sights, such as Notre dame cathedral, the unique Louvre museum with its glass pyramid as a contrast to its ancient architecture, the commemorative Arc de Triomphe, and the Eiffel tower. Alternatively, you may wish to join a guided walk through historic iîe st. Louis with its narrow one-way streets and Iîe de la Cité, the center of Paris where the medieval city was founded and home to Notre dame cathedral. In your free time, stroll down the Champs-elysées with its lavish cafés, or perhaps visit the world-famous Louvre or Montmartre with its gleaming white Sacré Coeur basilica and bevy of artists on place du Tertre. Paris is also well known for its colorful nightlife, and an optional outing to one of the world’s most famous cabaret shows, the Moulin rouge, might make the perfect finale to your seine cruise vacation. A non-refundable, non-transferable cruise deposit of $250 per person per vacation is required for Avalon to reserve space for you, with some limited exceptions as noted below. Avalon accepts checks, money orders, Visa, MasterCard, Discover/Novus, and American Express. Your booking is not confirmed and payment is not deemed made until the deposit is received by Avalon and you receive a confirmation invoice. 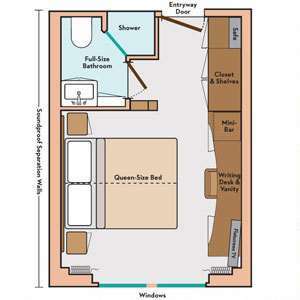 Your reservation will be automatically canceled if deposit is not received by Avalon by the deposit due date. On certain departures, deposits may be required at time of booking to hold or to confirm space for you. Payment of the deposit indicates you have read and accepted these Terms & Conditions. Enjoy unmatched service, sumptuous cuisine, panoramic views, first-class amenities, and spacious staterooms as you cruise on the Avalon Creativity. 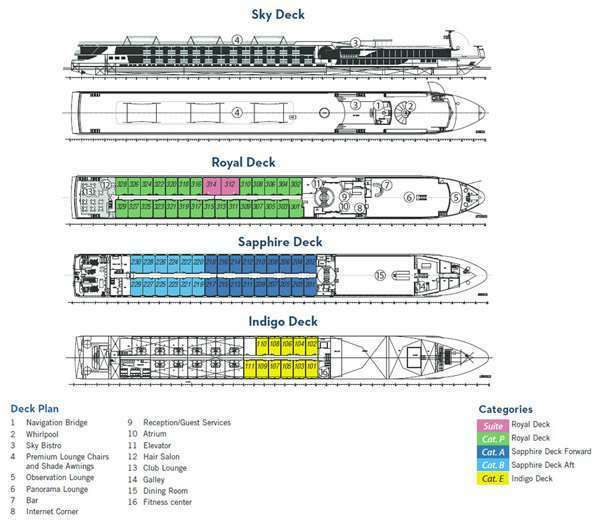 Carrying a maximum of just 140 passengers, the Creativity offers staterooms that are a full 15% larger than the industry standard-with floor-to-ceiling windows on two decks-so you'll be comfortable, relaxed, and fully engaged with the passing countryside. From a Fitness Center and hair salon to complimentary Internet Corner and free Wi-Fi access throughout the ship, the Creativity was built with an impressive collection of remarkable amenities to enhance your journey. The whirlpool on the Sky Deck allows for a refreshing dip after a day of sightseeing, while the self-serve beverage station serves up complimentary premium cappuccinos, lattes, hot chocolate, teas, and more throughout the day. This plush 953 room hotel offers a perfect base in the city's chic artistic hub. Free Wi-Fi access is available in all the guestrooms and public areas of the hotel. A fitness room, contemporary style restaurant with traditional French cuisine and a trendy lobby lounge serving drinks, snacks and cocktails complete the amenities. Departure April 25 is offered as an exclusive Culinary Cruise, including special lectures and tastings at no additional cost. Enter a food-lover’s paradise in northern France. At a special dinner, a local chef will dazzle you with regional specialties and food preparation tips. If you participate in our “Taste of Normandy” excursion, there’ll be cider and wine tastings, a visit to a distillery, and you’ll even come away with easy-to-make recipes. Bon Appétit! Departure July 11 is offered as an exclusive WWII History Cruise, including special lectures and features at no additional cost. Take a cruise through history! These fascinating cruises give you an even richer experience as you learn the stories behind Europe’s famous sites. Departure August 8 is offered as an exclusive Art & Impressionist Cruise, including special lectures and features at no additional cost. Experience scenic northern France with a focus on art as you explore Paris’ Musee d’Orsay, Chateau d’Auvers in Auvers-sur-Oise, and Rouen’s cathedral, and attend onboard art lectures by a local art expert.